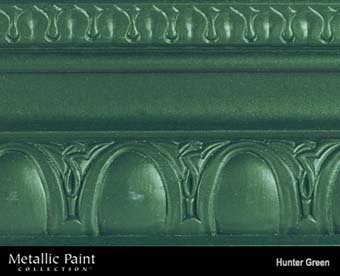 DiscountPaint.net :: DECORATIVE PAINTS :: METALLIC PAINT-MODERN MASTERS :: MODERN MASTERS METALLIC PAINT 99844 ME-432 HUNTER GREEN SIZE:6 OZ. MODERN MASTERS METALLIC PAINT 99844 ME-432 HUNTER GREEN SIZE:6 OZ. MODERN MASTERS® METALLIC PAINT COLLECTION™ is an elegant alternative to ordinary latex paint. Unlike other metallic paint, Modern Masters Metallic Paint Collection paints apply easily—like traditional latex paint. All colors can be applied by brush, roller, or HVLP spray gun. Modern Masters Metallic Paint Collection paints combine real metallic particles, mica, and traditional pigments to create the forty-color palette of beautiful, shimmering colors. This unique approach enables the creation of non-fading colors never before available. Metallic Paint Collection products are water-based and non-hazardous. They contain no lead, mercury, or other toxic ingredients. The absence of harmful solvents makes Modern Masters Metallic Paint Collection paints easy and safe to use. Low-odor, with the ease of water clean up. Follow standard practices and procedures for properly preparing surfaces for the application of traditional water-based latex paint. All surfaces to be painted must be entirely free of dust, dirt, oil, grease, and other contaminants. Completely remove all loose, flaking, or chalking paint from the surfaces. Use a NIOSH approved respirator when sanding and when working with old, loose paint particles. Provide adequate ventilation. Properly prime the clean, dry surface with a high-quality 100% acrylic primer (we highly recommend using Zinsser’s Bullseye 1-2-3® primer/sealer), and allow the surface to dry completely— preferably overnight. Note: Lower temperatures and higher humidities will lengthen the dry and cure times. Important Note: Do not apply Metallic Paint Collection paints over slick, glossy, or previously top-coated surfaces—apply ONLY onto properly primed surfaces. Modern Masters Metallic Paint Collection paints can be brushed, rolled, or sprayed onto any paintable, properly primed, interior or exterior surface, such as walls, ceilings, collumns, trim, doors, furniture, and paintable wallcoverings. Check the side of the Metallic Paint Collection label for paint hide and coverage characteristics. Opaque colors have excellent hide—two coats are recommended for best results. Semi-opaque colors have good hide—three coats are recommended for best results. Sheer colors are translucent overcoats that impart luster to traditional paints, other Metallic Paint Collection colors, or faux finishes and broken colors. Always test the product in a small, inconspicuous area before beginning a project to see if the desired results are attained. Do not apply in temperatures below 58°F/14°C. Stir the paint well before using. Brushing: Use a high-quality brush recommended for water-based semigloss paints. Rolling: To roll Metallic Paint Collection paints add up to 16 fluid ounces/473 milliliters of Modern Masters Metallic Paint Collection Extender for Rolling to 1 gallon/3.78 liters of Metallic Paint Collection paints. The Extender for Rolling imparts the ‘wet-edge’ time needed to avoid lap marks. Use the Metallic Paint Collection Roller to apply Metallic Paint Collection paints to large surfaces, such as walls. Use a 4-inch ‘sausage roller’ (such as a Wizz™ roller) to cut in corners, ceilings, and baseboards. Work in approximately 4-foot wide sections, keeping a wet edge, and finishing the surface by back-rolling in one direction, ceiling to floor. This procedure will minimize lap marks, properly orient the metallic paint particles, and ensure a uniform surface. Spraying: To spray Metallic Paint Collection paints, use an HVLP spray gun in combination with an air compressor. Note: Do not use turbine-type “air compressors” to power the HVLP spray gun; do not use other types of spray guns (e.g. airless spray guns). Air pressure at the HVLP spray gun needs to be approximately 65 psi, with greater pressures in the tank. If thinning is necessary, add up to 16 fluid ounces/473 milliliters of water to one gallon/3.78 liters of Metallic Paint Collection paints. Thin carefully, as over thinning of the paint will result in loss of hide and a reduction of the desired appearance. Use a NIOSH approved respirator when spraying. Provide adequate ventilation. Protective Clear Coating: In certain applications, such as some exterior areas and interior high-traffic areas, Metallic Paint Collection paints may require the use of a protective clear topcoat. A top-quality water-based, polyurethane/acrylic clear topcoat, such as Modern Masters MasterClear Semigloss or MasterClear Satin, improves washability, scuff resistance, abrasion resistance, and reduces the ‘rub-off’ of the Metallic Paint Collection paints. Important Note: Other clear topcoats- especially 100% acrylic topcoats-may dull and otherwise ruin the appearance of many Metallic Paint Collection paints. If you persist in using a different clear topcoat besides MasterClear, be sure to test a small area to ensure that the desired appearance does not become dull or otherwise change. Dry Times: Recoat time is approximately ½ hour. Dry-to-touch time is approximately an hour. Note: Lower temperature and/or higher humidity will lengthen the dry and cure times. Coverage: One gallon/3.78 liters will cover approximately 320 to 400 square feet/30 to 37 square meters. Clean Up: Clean brushes, rollers, tool, and equipment with soap and warm water immediately after use. Do not reuse containers and properly dispose of empty containers. Storage: Close tightly all containers when not in use. Store in a cool dry place away from direct sunlight. Do not freeze. If Metallic Paint Collection paints become frozen, allow the paint to completely thaw and come to room temperature before use. Stir thoroughly before use. USA 483-9583 SEAL PLUS FINISH (SF53) SIZE:1 GALLON PACK:4 PCS. SEYMOUR 20-654 SPRAY FLUORESCENT RED STRIPE INVERTED TIP WATERBASE MARKER SIZE:20 OZ. SPRAY PACK:12 PCS. WATCO 65831 DARK WALNUT DANISH OIL SIZE:1 GALLON. MINWAX 26030 ANTIQUE MAPLE 603 GEL STAIN SIZE:1/2 PINT. BACK TO NATURE 29731 RD01 READY STRIP DECK STRIPPER SIZE:1 GALLON. RUSTOLEUM 72128 7212830 SPRAY PAINT LT BLUE HAMMERED STOPS RUST SIZE:12 OZ. SPRAY PACK:6 PCS. WOLMAN 12106 DECOWHITE WATERBASE DECK & PORCH PAINT SIZE:1 GALLON. VARATHANE 242606 GLOSS FLOOR OIL 275 VOC SIZE:1 GALLON.